My zip only goes down the bag to just below my waist, though. The only thing I could stick out of that hole is of far too small a surface area to be any use at all as a cooling fin. A secondhand Coleman suitcase stove because (a) I like cleaning up and rebuilding them and (b) the butane stove we have for family camping is hopeless, with all the power of a Bic lighter even with a full gas bottle. And it takes up way too much space in the car when you add on that huge steel bottle, and it's a pain to connect the hose every time. I bought the smaller one and found in kitchen trials that it works better under my pot (http://www.backpackinglight.co.uk/product513.asp?PageID=100) which is broader than my Ti mug and made of thinner metal. Got my Solo wood stove yesterday and tried it in the garden. Excellent little tool. It's a pretty nifty bit of kit that allows you to boil a pot of water on a thimble full of meths. It's also really stable, it would take a significant knock to tip your pot over, and it is silent on operation. £37? I need to start making stuff like this. I could not be bothered with all that pish, however. Let me know how it works. That's just under half the price of Primus Power Fuel (sold by Cotswold Outdoor, £6.30 a litre if you have a National Trust card and get 10% discount). Mind you, the best quality low-odour white spirit is £6.99 for two litres and burns very well if you treat it as kerosene in a multifuel stove. It's pure hexane, so at the lighter end of the Naptha scale, and the feedback on the Bushcraftuk forum is that it burns well in lanterns and stoves (http://www.bushcraftuk.com/forum/showthread.php?t=94673&highlight=TETROSYL). I've still to use it in anger but I'll let you know how I get on. By the way delivery was free and it turned up in 2 days. I just received the Mountain Laurel Designs Trailstar which I ordered from the US 6 weeks ago. It's essentially a big pentagon of Silnylon that can be viewed as a very basic tent or a quite fancy tarp. The backpacking nerds have been raving about them so I though I'd see what all the fuss was about. Purchased a new black oxide leatherman wave to replace a rebar. The rebar is covered in rust, even after being regularly oiled it is now relegated to the shed! I noticed Chris Townsend using something like that on his blog photos, I used my new TarpTent Moment on a backpacking trip recently and though it wasn't as comfortable as my regular tent I really noticed the ease of pitching, extra room in pack and maybe weight saving too. For cycling, I really don't understand why anyone should need more than this as if the weather's that bad you wouldn't enjoy cycling in it, would you? Will you be using a bivvy bag inside it? - I got a Wild Country one that only weighs 200g. Would probably be a good business opportunity for someone to import these as the custom charges take ages and the postage is prohibitive, as you point out. It is the shelter that Chris Townsend has been raving about, which is how I first became aware of it. I also managed to dodge any customs charges so it only cost around £130 including postage, which is pretty good value for a hand made piece of kit. I'm not planning on using a bivvy bag, I've got an Oookworks bathtub floor that I can use but I've also ordered an Oookstar nest for it. 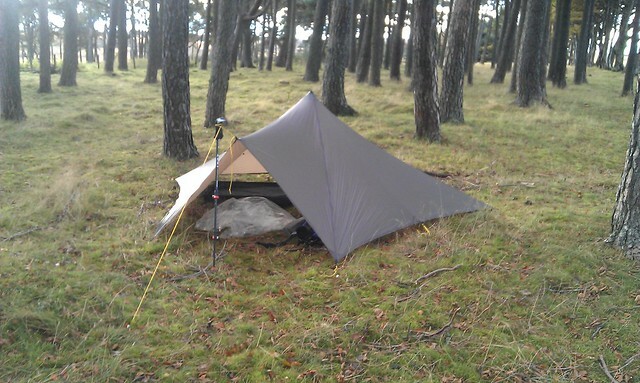 This is essentially an inner tent for the Trailstar and the whole weight for the Trailstar and nest will be around 1kg. Looks great, I might have been tempted myself if I'd known about them, but I'm also v happy with my Moment which I successfully pitched in coffin-sized spaces 2 nights running when I was nearly benighted on the hilltops and hunting for a water source - will try to upload some pics and do a write-up sometime. The room in the porch is just what you want, sling gear around and cook freely, though I did manage to fit all my gear including rucksack in mine AND cook quite safely with the fly closed during rain, believe it or not (though I'm sure some people here will say I'm lucky I didn't burn myself to the ground ...). The main inconvenience I find with it is the low height at the foot ends which means it's easy to catch the canopy with your head which brings down a lot of condensation drips - wouldn't matter in summer but for 3-season use I'd probably take my regular one in future at 1kg more. I got this for potential unicycle-packing trips and airport stops as it can be pitched without pegs using a second crossover pole. The Ookworks also do a mod to the Moment to fit a T-zip to the inner so the whole front can be opened up. Very useful site for any repairs or mods that ever need to be done. Another Alpkit timug and an Alpkit ticup. The cup fits inside a jetboil if anyone is interested! I like Alpkit stuff. A Bulin t4-a stove, arrived today. Amazing for the price! A cheap MSR pocket rocket clone and a clone of an Optimus stove. These fit inside my mugs. I have developed a stove fetish over the years! Following a brief visit to Decathlon, an aluminium cup which could be useful, mainly because it has 100, 200 and 300ml markings on it. I also got some cheap waterproof matches, which admittedly aren't in plastic containers like some of the previous ones, but at £3 for four packs, they're cheap enough that they're handy to have. Four lightweight Exped tent pegs to supplement our dying collection of Hilleberg pegs. Oh, and a big rucksack for Woolly so we can do overnight hikes in Tasmania while our bicycles wend their way slowly home through the waves (we're shipping them back on a boat). Trangia 27 UL with anodised pans. 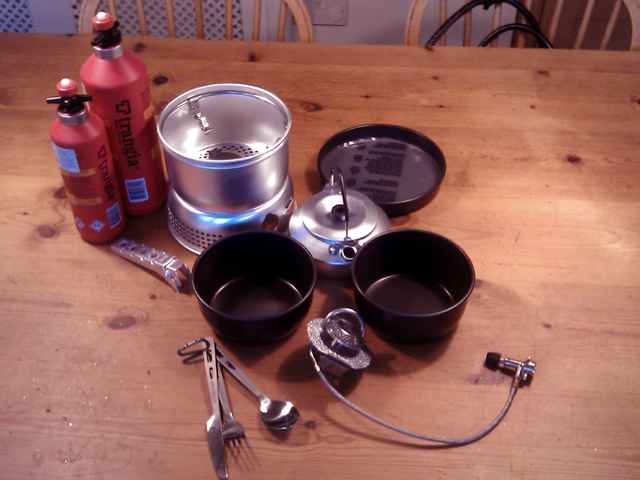 Additional Gas burner, some Ti cutlery and some fuel bottles. The Trangia kettle was additional but it still fits inside the pans, the burner fits inside the kettle and so it doesn't increase packing size at all. We have the same Trangia 27. It's been absolutely brilliant during our trip and has allowed us to eat proper meals, even in the most remote places. Though, the anodised pans have now lost all their coating. We simply love our little kettle, and to think we nearly left it at home! ... We simply love our little kettle, and to think we nearly left it at home! How else would you have a proper cup of tea? !